1 Approximate battery life based on a mix of talk, data, standby and use of other features, with always on display off and mobile hotspot off, according to a user profile as defined by Google. An active display or data usage will decrease battery life. Wired charging: rates are based on use of the included charger. 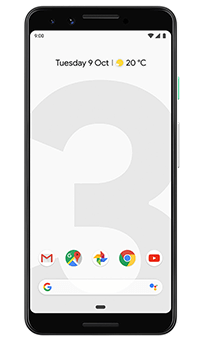 Wireless charging: Up to 10 W with Pixel 3 and Pixel 3 XL, charging with Pixel Stand (sold separately). Actual results may vary. Disconnect from your phone when and where you want so that you can focus on time with family and friends. Set timers on apps and turn off visual notifications. Use the wind-down mode to turn the screen to grey-scale and get ready for a good night's sleep. Try searching what you see with Google Lens1 to look up clothing and home decor, copy and translate text, and help identify 1000s of landmarks, plants and dogs. Play with life-like AR stickers for your photos and videos. 1 For available Google Lens languages go to g.co/help/lens. Requires Internet connection. 2 Requires a compatible smart thermostat and compatible smart light bulbs. 1 The Google Assistant on Google Pixel Buds is only available on Android and requires an Assistant-enabled Android device and data connection. Data rates may apply.